The Maritime Silk Road (2011) is an Iranian action/adventure film covering historically significant material that is probably not well known to the general public. 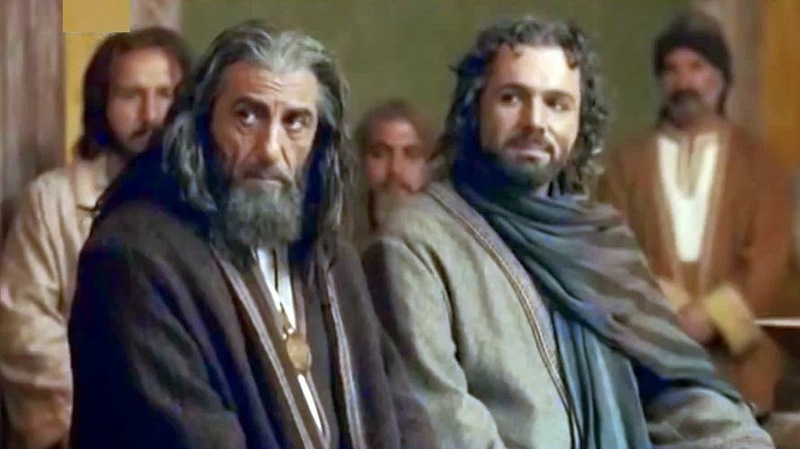 Perhaps because of this historical setting, the film, under the direction of Muhammad Bozorgnia, differs from the characteristic and internationally admired Iranian personal perspective and offers up more of a Hollywood-style spectacle. This more or less results in a thumpingly entertaining story, but, like other spectacles of this type, it has some flaws, too. The story concerns the true, but heavily dramatized, adventures of Soleiman (aka Suleiman) al-Tajir , an Iranian merchant sailor who is believed to have made the first complete ocean voyage from the Middle East to China back in the 9th century CE. His ocean travel covered a continuous route from Siraf, an ancient seaport on the southern coast of Iran, all the way to Canton, China. Actually some commentators say he made this voyage in 775 CE, but in any case the written account of his voyage became widely known after 850 CE. This epic voyage was of enormous cultural and economic significance, because it opened up the maritime trade routes between China and the West. In connection perhaps with its fame at the time, there is some speculation that Soleiman’s adventures may have served as the seeds for the tales of the Seven Voyages of Sinbad the Sailor, which are part of the Western versions of the Arabian Nights [2,3]. The production values of this film are at a high level, including expert cinematography by Bahram Badakshani and a cast of leading Iranian actors. In fact the cinematography – which includes spectacular crane shots of the ships out at sea, as well as atmospheric shots of palace grounds and interiors – is so good that it helps compensate for some weaknesses in other aspects of the film. Captain Nakhoda Soleiman is played by Dariush Arjmand. He, of course, is the principal historical character, but the narrative focalization is not centered on him but on his assistant Shazan. 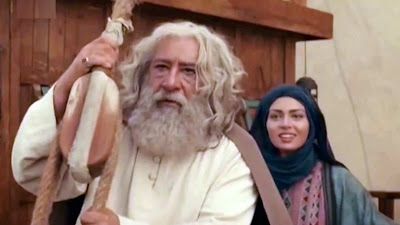 Shazan Ibn Yusuf is played by Bahram Radan, who also starred in Dariush Mehrjui’s Santoori (2007). Shazan is a recently educated young man who joins Soleiman’s crew in order to write a chronicle of everything that happens along the way. Captain Nakhoda Edris is played by Reza Kianian, who also starred in The Wind Carpet (Kaze no Jûtan, 2003) and The Fish Fall in Love (Mahiha Ashegh Mishavand, 2006). He is the captain of a second ship that accompanies Soleiman’s on the voyage. Mardas (Payam Dehkordi) is the first mate of Captain Edris's ship. Mahoura (Pegah Ahangarani) is a beautiful Iranian noblewoman who had earlier been captured by bandits and sold as a slave. She provides the welcome inclusion of some feminine pulchritude in this othwerwise all-male tale. I will have more to say about her performance below. I might also mention Ezzatolah Entezami, who has a small role as a slave seller in this story, but whose distinguished acting career goes back to the 1940s. It includes many films directed by Dariush Mehrjui, including Gaav (The Cow, 1969), The Cycle (Dayereh Mina, 1978), The Tenants (Ejareh-Nesheenha, 1986), and Hamoun (1990). The connection that The Maritime Silk Road has to Mehrjui, by the way, extends also to director Muhammad Bozorgnia, who had earlier served as an assistant director on Mehrjui’s The Postman (1972) and The Cycle (1978). The Virtuous. On this side are Soleiman and Shazan, who are invariably heroic, industrious, honourable, and sensitive to others’s needs. In fact like all good scouts, they are trustworthy, loyal, helpful, friendly, courteous, kind, obedient, cheerful, thrifty, brave, clean, and reverent. The Wicked. On the other side we have Edris and Mardas, who are deceitful, vicious, slovenly, venomously cruel, and despicable in every way. Moreover, rather than being reverent, they believe in magic and seek to invoke satanic powers to support their evil intentions. In short, they are rotten to the core. All along the way of the voyage, these two groups are, besides just hoping to survive the rigours of their journey, seeking glory, riches, and the pleasures of having the company of the beauteous Mahoura. The film’s narrative passes through eight event sequences associated with the encounters that the journey provides. In the 4th century of the Hijri calendar , Shazan, a young graduate of the Shiraz Academy, is sent by his master to work with the sea captain Soleiman, who is about to set out on an ambitious and groundbreaking voyage to China. Soleiman needs a literate man to write an account of everything that they encounter along the way. 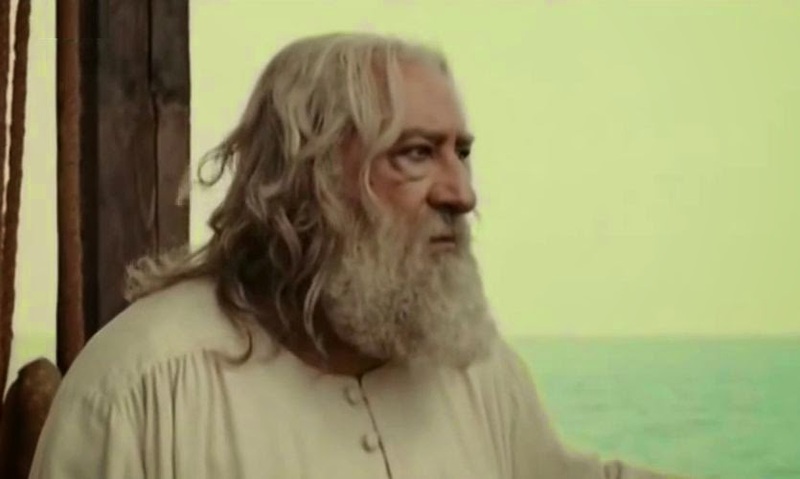 Soleiman enlists financial support from the Sultan of Siraf, who responds favourably and assigns another ship captained by Edris to accompany Soleiman’s ship, with Soleiman placed in charge of the whole mission. The malignant natures of Edris and his first mate, Mardas, are immediately evident when they are shown to employ a magician/seer whom they threaten with bodily harm if he does not provide them with favourable predictions. 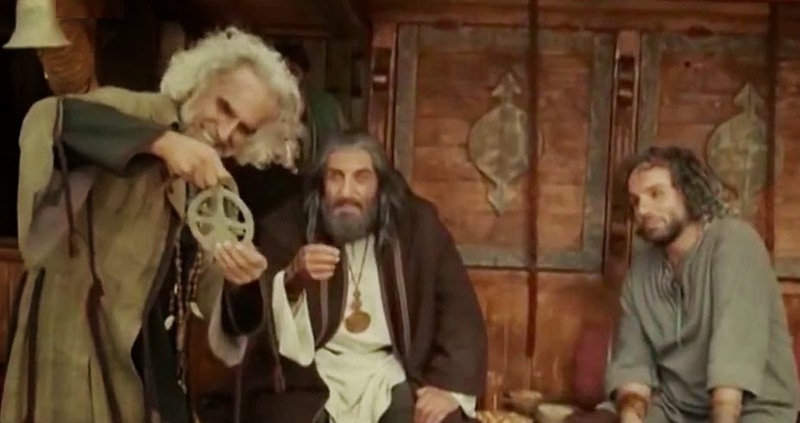 The ships set out, and Shazan, the center of the film’s focalization, begins to learn about the sailing craft. They stop at Muscat, Oman, which is a big trading center that includes the sale of slaves. Edris purchases a beautiful Iranian “princess” (Mahoura) who had the misfortune of being captured and made a slave by pirates. 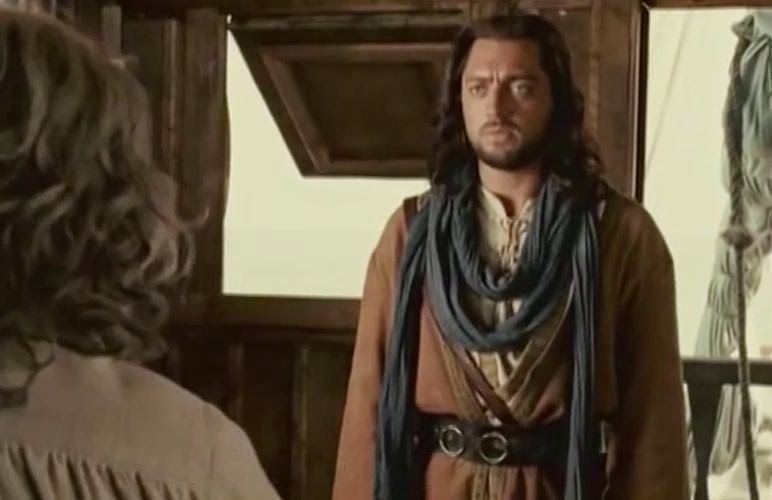 As commander of the two-ship fleet, Soleiman forbids Edris to take the woman on the trip, but Edris refuses and announces that from now on his ship is going on independently. The Soleiman and Edris ships, now sailing near each other but separately, depart from Muscat and soon encounter a typhoon. Afterwards they come upon a “ghost ship” with a full cargo but no living crew members. Soleiman orders that they not take on any of that ship’s cargo, because the additional weight will slow them down. Edris and Mardas have other ideas, though. Mardas and some of his fellow crew members come aboard the ghost ship, beat up Shazan, and then proceed to loot the cargo and take it back to their own ship. Afterwards back on his ship, Edris tries to seduce Mahoura. When this fails, he forces himself on her. 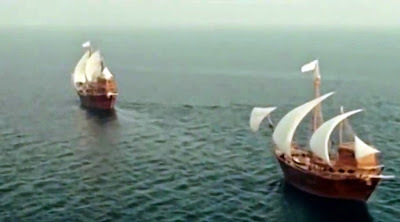 Later at sea the two ships are accosted by sea pirates. There is colourful footage of Shazan using Soleiman’s catapult to launch flaming “cannon balls” at the pirates’ ship, but that isn’t enough to halt the onslaught. The pirates storm aboard Edris’s slower ship (because of its added looted cargo), and a melee on the deck ensues. Edris is killed, but Soleiman’s ship comes over to help Edris’s ship and subdue the pirates. With Edris dead, Soleiman takes command of it and, much to Mardas’s frustration, orders that Shazan be made the new captain of the Edris ship. They next arrive at the enchanting Maldives islands in the Indian Ocean and present its queen with gifts to ensure a warm welcome . With Edris gone, Mahoura is offered the chance to go back to Iran, but she feels she is better off continuing on the trip with them. Soleiman says that is only allowable if she marries one of the crew members; so Shazan offers to be a celibate husband, and she agrees. A sumptuous wedding ceremony is then performed. They depart for China, but they encounter another typhoon that damages the Edris ship, causing them to lose all its drinking water. Soleiman honourably orders that water be shared all around, but there is not enough, and soon the sailors are all close to dying of thirst. Just before they are about to die of thirst, though, they come upon a strange island ruled by a savage and hostile king. With Mardas having been slain by the king’s men and Soleiman held hostage, Shazan is sent back to their ship to bring back some jewels as tribute/ransom. Shazan and Mahoura manage to make it back to the ship where the rest of the crew awaits. At night they return to the island, rescue the nearly dead Soleiman, and set sail once more. They finally arrive in Canton, China, where local physicians revive Soleiman. 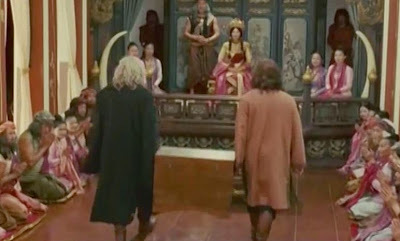 The ruler of Canton graciously welcomes his visitors and proposes a bilateral trade pact with Persia (Siraf) as the film comes to a promising close. Intrusive Music. The musical score for the film is by Kwong Wing Chan, who made the music for the Internal Affairs films directed by Wai-Keung (Andrew) Lau (2002, 2003, 2003). Unfortunately, the music here is mostly distracting, and many times trivializes the dramatic situations. In particular, the music is too much imbued with brass (horn) orchestration. Everyone Speaks Farsi. 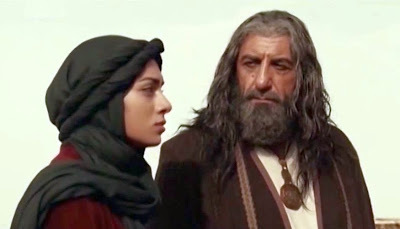 The fact that everyone speaks the Farsi language in the film may be convenient for the film's presenters, but it detracts from the wonder and mystery of exploring foreign and exotic lands. Even popular Hollywood films often introduce interpreters for these circumstances to maintain some credibility. Fake Fight Scenes. 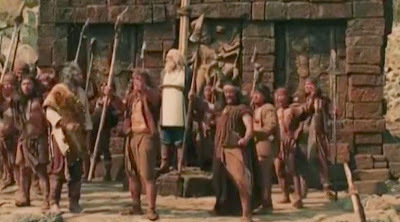 The hand-to-hand fight scenes that take place in the film are artificial and poorly performed. In many case it doesn’t appear like fistic contact is really made, and the goings on appear to be more like slapstick than real fighting. Exaggeration of Good and Evil. The black-and-white character portrayals of the principal male characters is a big problem and inappropriate for a historical drama. This is sometimes undertaken for children’s fairy tales, but even then, the kids often laugh at the Snidely-Whiplash-type characters as buffoons. Here it just doesn’t work with the story presented. Despite these limitations and within the rather severe constraints imposed by these narrowly conceived dramatic roles, the acting is pretty well done. Of particular interest is the performance of Pegah Ahangarani as Mahoura. She has little to say in the film (and her presentation is thoroughly chaste, with no head-hair shown and no suggestive gestures), but still she does manage to add something to the overall drama by means of the wistful, emotive expressions on her face as she reacts to what is going on around her. As such, she makes the drama a little more human. In fact with Ms. Ahangarani’s performance in mind, it is worth reflecting on what was the lasting value of Soleiman’s epic voyage and the film’s ultimate message. Certainly that voyage was a seminal historical act that helped open up trade and cultural exchange benefiting Iran and the wider world around it. The societies subsequently involved in such exchange became exposed to new goods, new ideas, and new ways of doing things. Thus the new maritime routes for exchanging ideas opened up the world for the betterment of all. And so one could say that the film serves as a statement in support of intrepid pioneers who opened up new ways of exchanging goods and ideas. It is ironic, then, that Ms. Ahangarani, whose mother and father are both flim directors and who has been an active journalist as well as a film actress, has been punished by the Iranian government merely for expressing her ideas. She was arrested and confined in Iran’s notorious Evin prison in 2009 and 2011, and she was sentenced to an 18-month prison term in 2013 [6,7,8,9]. If you do manage to see The Maritime Silk Road, you may want to keep in mind as you watch that there are people in Iran like Pegah Ahangarani who are trying to open doors and new paths today, just as Soleiman and Shazan did centuries ago. Kallie Szczepanski, “Was Sinbad the Sailor Real?”, About.com, (2015). Laura Kelley, “Maritime Silk Road”, The Silk Road Gourmet, (2015). As I mentioned above, Soleiman’s real voyage probably took place at least a century earlier. At this time in history, the Maldives population followed the Buddhist faith. They were later converted to Islam. “Iran Releases Prominent Actress on Bail”, Voice Of America News, (27 July 2011). Saeed Kamali Dehghan, “Iran Releases Prominent Actor and Filmmaker”, The Guardian, (27 July 2011). “Iranian actress Pegah Ahangarani Arrested Earlier This Month: Report”, The Daily Star (from Agence France Press), Lebanon, (18 July 2011). Nasser Karimi, “Iranian Actress Pegah Ahangarani Sentenced on 'Security Charges'”, CTV News, Canada, (29 October 2013). Hello, contratulations for this blog. 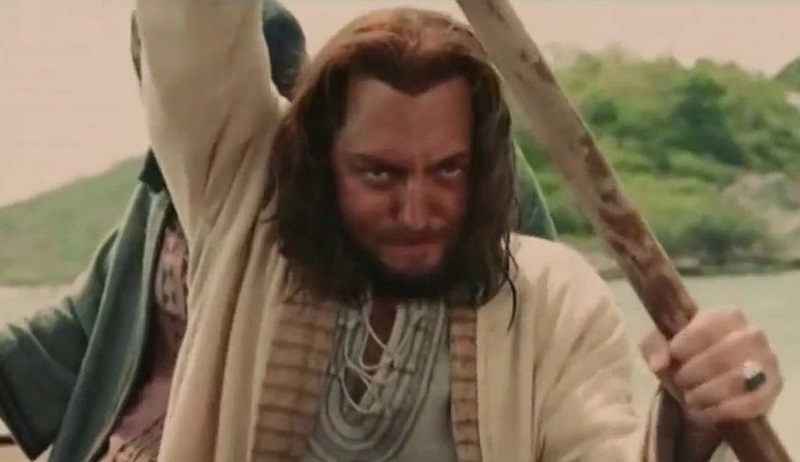 Do you know more about the construction of the ships replicas for this movie? No, I don't have information on the ships used, but I will investigate. Thanks for responding and good luck with the research!